Multifunctional high precision scales, suitable for laboratory and industrial use. The completely stainaless steel structure makes this scale suitable for the environments with strict hygiene requirements. Fitted with internal auto-recalibration system. Available also CE-M APPROVED for legal for trade use. DIVISION (g): 0.1. CAPACITY (g): 22000, 33000. High contrast fluorescent display with 8 digits. Waterproof membrane keypad, with 10 keys and 2 LED for active functions indication. Waterproof construction completely in IP65 stainless steel. Stainless steel plate, size: 400x350mm. Power supply: standard fitted with 230 Vac power adapter. Cable 1m long, for connection between platform and indicator. CT2 ISO 17025 (ACCREDIA/DAKKS) calibration certificate for analytical scales with capacity greater than 5 kg. 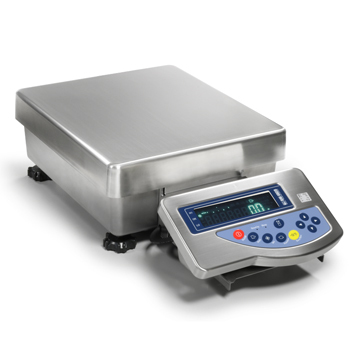 ECEM1M CE-M approval for class I or II scales with capacity more than 6kg up to 35kg. RSCBBCG (S1) RS232 cable l=1,5m for printer. RSCBSHG (S1) RS232 cable for 3590EGT connection. GAEPKC Column kit for GAEP-K scale. SHAL16 12V 1000mA power supplier. 15GAEPKA Rubber bracket for cross plate (GAEPK and GAEPKR). 15GAEPKC Moulded protective covers in transparent plastic (GAEPK e GAEPKR). 15GAEPKF Adjustable foot (GAEPK e GAEPKR). 15GAEPKO Sticky overlay for display (GAEPK and GAEPKR). 15GAEPKSP Stainless steel weighing plate (GAEPK e GAEPKR).